Arcane spellcasters are an indispensable factor in fantasy gaming. You always want at least one in your party, and you always cringe when you find out the enemy has one on their side. Be they bards, sorcerers, or wizards, you'd be hard pressed to play a good game without them. And let's face it - they're incredibly fun to play. But are you tired of the same old choices for your characters? Same spells, same familiars, same sorcerer bloodlines... they even find the same magic items in every dragon's horde. Looking for something new? 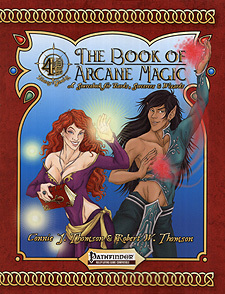 With The Book of Arcane Magic, you can flesh out those magic-users as never before. Inside this book you'll find over 100 new spells, from minor cantrips to 9th-level powerhouse spells. Want a unique background for your character? Make your spellcaster a graduate of one of eleven colleges of magic and bardic schools, or give your sorcerer one of ten new bloodlines. You won't be stuck with a cat for a familiar after taking a look at the ten new options in this book. And there's a virtual treasure chest full of new magic items for your party to argue over. A great resource for both players and Game Masters, in low-magic and high-magic games alike, The Book of Arcane Magic will add a fresh spark to your fantasy gaming experience.